The Homemade Bread Challenge is rolling right along and I have to say that the third and most recent item is definitely the easiest I have made and also without a doubt my favorite so far. When I first saw this pin from Cooking for Seven I was skeptical. I didn't really believe that great bread could be so easy. I mean they sell bread in stores for a reason right? Wrong. Basically all it takes to make amazing bread is so stir four ingredients together in a bowl (one of which is water), let is rise and then bake it in an oven with a pan of water. Sounds too good to be true? I promise you it isn't. When Justin tasted this bread he looked at me and said, "Why would anyone ever buy bread again?" And I have no answer to that question. 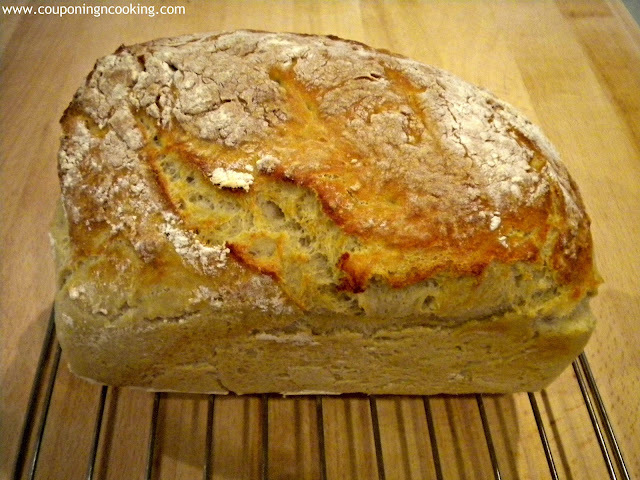 We ate this bread hot out of the oven with Butternut Squash Tomato Basil Bisque and it was delicious. We couldn't get over what an amazing crust it had and how light and airy the inside of the bread was. It was like really good bakery bread except the bakery was our house. And man did it smell ridiculous. Best part? It made two loaves so I froze one and cannot wait to have it as a no hassle treat once school starts and my motivation to make things from scratch drops to negative one million. 1.) Pour the yeast and salt into the warm water in a large bowl and gently mix. 2.) Slowly stir in the flour with a wooden spoon. If dough is still very sticky, add more flour until dough has formed up a little bit. 3.) Cover with a clean cloth and let dough rise. I left mine and went to church so it probably sat for close to three hours all said and done. 4.) Dough will have risen and flattened out on top. Punch dough down and form into loaves in a lightly greased and floured pan. You could make any shape you like or use any pan you like or you could skip the pan all together and just form it on a baking tray. Whatever you prefer. 5.) Lightly flour the top of your loaf and cut a few slits in the top of the unbaked loaf. 6.) In order to get the crust on the bread, you will need to preheat the oven to 450 degrees and put a metal pan or broiler tray in the over while it is preheating. 7.) When you put the loaf in the oven, pour a cup of hot water in the pan and then shut the door and let the steam do its job. I baked mine for about 30 minutes or until the top looked nice and brown and crispy. 8.) Try to let it sit for awhile before slicing. We only made it about 20 minutes but it was all we could mangage. I invite you to join me in making the items on my list or to make any kind of homemade bread you want. If you post your results on your blog feel free to link them up below or copy the Blog Hop code and put it on your post as well. The more the merrier! Made any type of bread lately? Like up your posts and pictures here! The linky will be open and used on all future HMBC posts through September 13th! This sounds like the bread for me....EASY and I LUV easy. I didn't know about your link party...will try to enter. This bread looks so good, there is nothing like homemade bread! Hope you have a great week end and thank you so much for sharing with Full Plate Thursday. Ooo, thanks for sharing at my Meatless Monday hop! 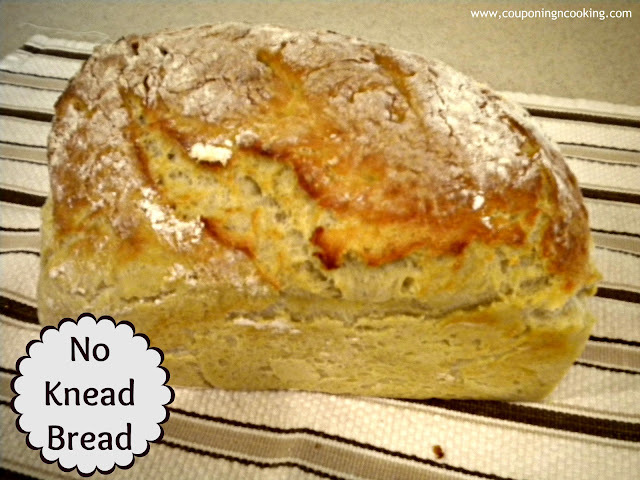 Are bread machine-made breads allowed at your linky? I've only blogged about the ones I made with the machine, and it's been a while since I made one without! It's hard to find the time these days! 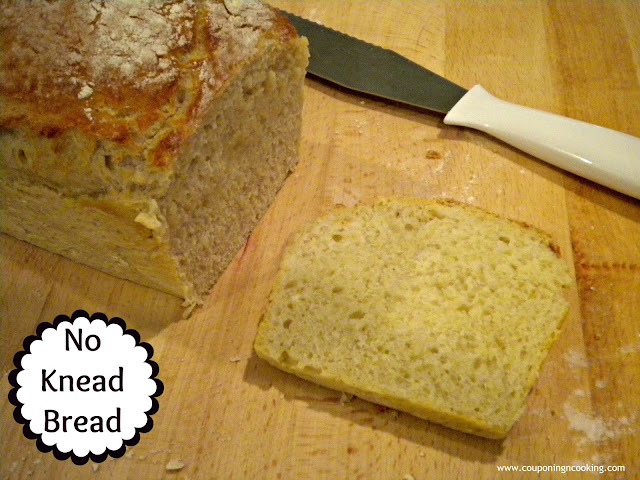 Homemade bread is the best and it is being featured at the Recipe Box. Thanks for sharing it. Homemade bread is always the best! Thanks for sharing on Busy Monday!